I was about to purchase gelstain today until I read your blog! 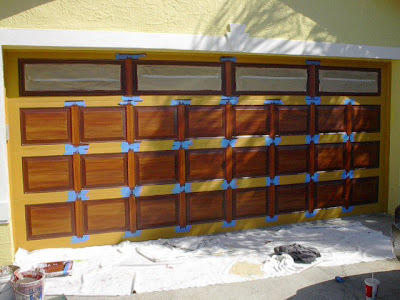 You mention adding Varathane to the second coat but did you add it to the first? 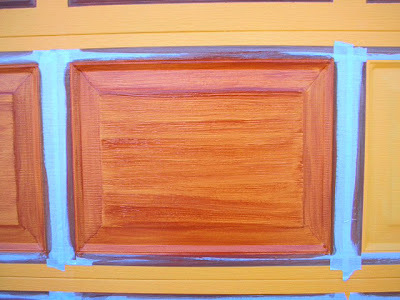 When adding the second color is it mixed well or do you leave it partially-mixed. I picture it not fully mixed to give you a streaking pattern but I am probably wrong. I also would like to request some detailed instructions, mix ratios etc. What shade of wood color has looked best against a medium to dark gray house? Oak? Cherry? Mahogany? And if you have a preference what colors do you use to obtain that shade? I only get one shot at this! I can only hope to have a fraction of your talent with a brush. Brandon, give me your email address and I will send written instructions. or email by clicking on my website and then the contact page. That way I will get your email address to send the instructions. 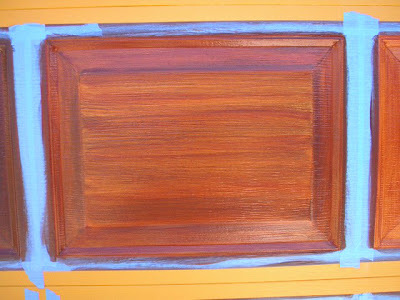 I just stumbled on to your blog, looking for wood tone exterior glazing to hold glass onto an antique door we had refinished. all I can find is white which would look terrable. Any suggestions? I am sorry but I have no idea about the window glazing. 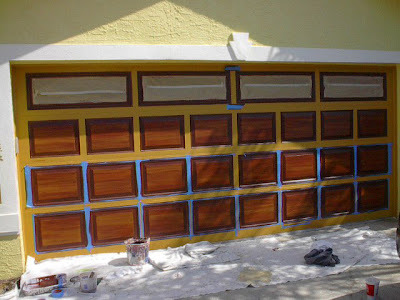 IF you email me at my regular email I can send you written instructions for painting a garage door. great job !!! 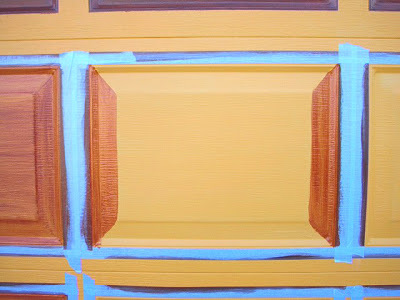 I've been looking for hours at faux painting projects and yours is the best I've seen. Please send me detailed instructions. do you put one or w coats of the first step? 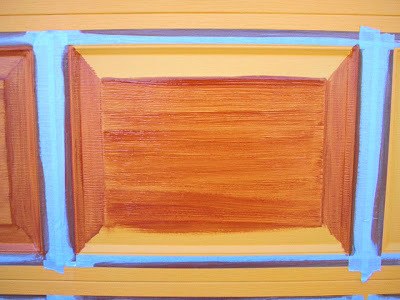 and do you thin down the 2nd step or use straight paint? Great job. 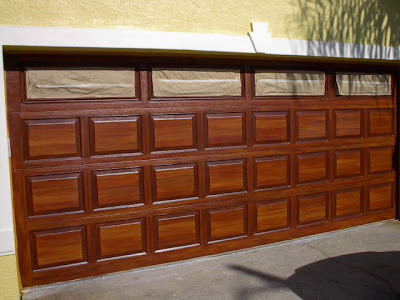 The ugly garage door is a personal beef of mine. 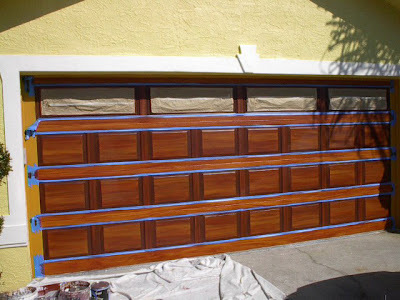 That is why I created several pages on the garage door problem at my website at http://www.house-design-coffee.com/contemporary-garage-doors.html . I'd like to add a picture of your work with a link to this page. If you don't like that idea, let me know. If you do, let me know. 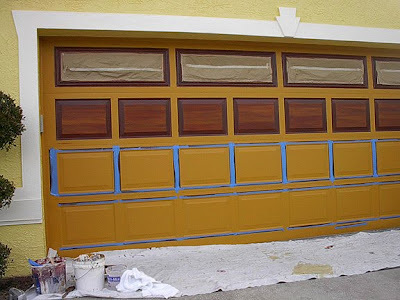 Would you please send me instructions for painting a garage door? Look in the menu bar at the top of the page. There is a tab there for the written instructions. LOVE LOVE LOVE your work. My double metal garage door has been painted white for all of it's 12 year. I thought it was just dirty, but turns out the paint has been scraped away by the raising and lowering of the door by the weather stripping. Any thoughts? Can I do without the weather stripping? Thanks for any advice. Just want to say how generous of you it is to share this incredible technique with all of us homeowners out here. Thanks so much!